In Season: Hoods Are Here! Our correspondent Anthony Boutard of Ayers Creek Farm is back with his weekly bulletins, and GSNW is happy to post his musings once again. To get them fresh in your in-box, simply e-mail Anthony directly. Or check in here for the skinny on what's happening in the natural world. You can find Anthony and Carol live in the flesh every Sunday at the Hillsdale Farmers' Market from 10 am to 2 pm. This has been a very peculiar season by any measure. Almost every crop in the field is 10 days to two weeks late. Our frikeh production, which normally occurs around the 18th of June, will start on Monday. Because of heavy weed pressure, the harvest will be a salvage operation, with a sharp production decrease for this year. We will have to collect the heads using small sickles once used to harvest rice in the Orient. There will be few gage plums, but a good crop of prune plums. The Chester blackberries will have an excellent crop, albeit late. The flowers are just opening on the grapes, and they should produce well this year. Most of our squash fall into the past tense...squashed. The pampered melons are doing well. Despite the languid pace of the season, and what season it is we are not quite sure, it has been very busy. Feeling subdued and disconcerted. Funny, as we plant more and more stuff, the works piles up on us. 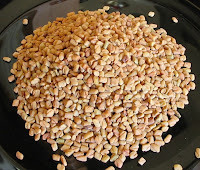 Fenugreek is a low growing legume. The seeds (left) are used as a seasoning. The greens (photo, above) are used in Indian and Persian dishes (see Khoresht-e Ghormeh Sabzi for example). 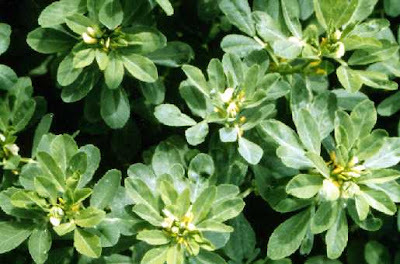 Pleasantly bitter and very fragrant, they can be mixed with other greens such as spinach, or used to season potatoes or lamb. New potatoes are harvested while they are still growing, the tuberous equivalent of fresh shell beans. The potatoes have yet to form their permanent skin, a process initiated by the green part of the plant. They are perishable, and should be refrigerated. Size is not a good diagnostic as you can have very large new potatoes, as well as dinky ones. They also require careful cooking, no rolling boils. They make a good potato salad. They can also be sauteed or roasted, and dressed with chopped wilted fenugreek, as in the Indian dish aloo methi. Good hot weather sustenance. A Mexican term, equivalent to the Italian verdura trovata (encountered greens) and Greek horta, refers to a mixture of noncultivated edible plants that grow in the fields and on roadsides. Quelites include lamb's quarters (fat hen) and pigweed (amaranth), and are very nutritious. The names "fat hen" and "pigweed" are not the least bit derogatory, rather they refer to the tendency laying hens and nursing sows to seek out these calcium rich greens. In the mix will be some Quinoa, Orach and Polish Amaranth. Cook and use as you would spinach. There is something almost mystical about walking through the door of a restaurant and feeling like you've traveled to a foreign country. Something about the arrangement of the room, the smells, the other customers, the menus. It's like a mini-vacation, a trip outside our humdrum lives if only for a couple of hours. Our half bottle of wine. We were out running an errand the other evening and ended up on NE 28th Avenue. It being a Monday night, most of the restaurants were closed, but as we got close to Burnside we noticed a couple of people sitting out front at Navarre. Now, we hadn't been in this place for at least a year but had always liked the food, so we decided to stop and see what was up. 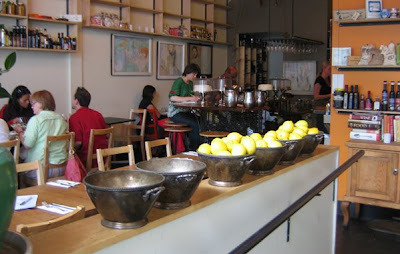 Along a wall by the door was a line of metal bowls, several filled with fresh lemons, the room about half full of families and couples sitting at simple wood tables or at a metal bar that wrapped around the open kitchen. Shelves on the walls held boxes of rice and bottles of vinegar and row upon row of home-canned fruits and vegetables, like we'd stumbled into a neighborhood cafe in Barcelona. Tongue and porcini mushroom salad. 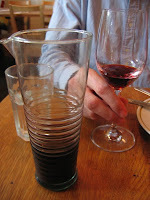 The half bottle of wine came in a quirky glass pitcher that we poured at our leisure, quickly followed by a very fresh, melt-in-your-mouth plate of tuna topped with lightly pickled onions. Alongside was the tongue and porcini mushroom salad special, little slices of braised tongue tossed with sauteed chunks of porcini and bitter greens dressed with vinaigrette. I love the moist tenderness of well-prepared tongue, and its sausage-y texture with the juicy porcinis and tangy greens was one of the best things we ordered, and something I'll be trying to replicate at home. 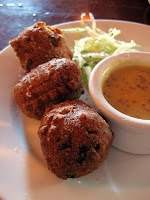 We also had a plate of their homemade caraway sausages and another special, the seared halibut with aioli. The sausages were excellent, and we ordered bread (everything on the menu is priced separately) that came in handy for sopping up the fatty juice. 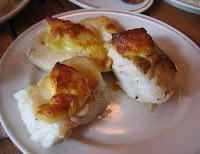 The halibut, like the tuna, was perfectly cooked and moist, though the aioli was a little eggy after being seared (it would have been better fresh). The menu offers most plates in small and larger portions, and we found that ordering a variety of each size gave the three of us plenty to share. As in many tapas bars, you write down the order for the table on a piece of paper and hand it to the waitress, which is a little confusing, and the small checkboxes for small plates and slightly larger boxes for larger plates needs a better UI (ooo-eee, or "user interface"). Great for those "I don't feel like cooking" or "Let's go someplace different" nights, the prices are very reasonable and the preparations are terrific. 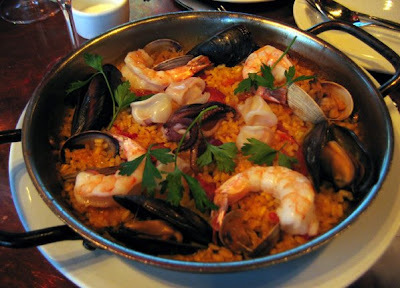 And the vacation in Spain for the cost of dinner makes it well worth going back to. Details: Navarre, 10 NE 28th St. Phone 503-232-3555. It's always exciting when friends realize a dream they've been working toward for years. And even better when that dream is to open their own bar. Better than that would be a bar with simple noshes located not too far from our house, maybe within biking distance. Randy at the back-bar sink, not for the first or last time! 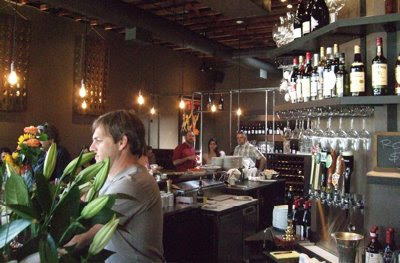 So we must have had some good karma stored up, because our friends Nancy Hunt and Randy Goodman decided to open Bar Avignon on the corner of 22nd and Division. To say that it's changed from its days as the Red & Black Cafe is like saying that Michael Jackson had a little work done. With its storefront windows looking out on the street, a 25-foot-long standing bar and cozy banquettes ranged around the periphery, this place is friendly and sophisticated all at once. Hey, Nancy, when can we get a t-shirt? And the surprise, tucked away in the back, is a long dining table suitable for up to ten people for tasting dinners, parties, gatherings or what-have-you. The dark walls and sophisticated lighting could have been too uptown for this corner, but in this case they serve to make it feel like a place you could hang with friends, sipping and snacking. You can bet that's what we'll be doing. And soon. Details: Bar Avignon, opening Friday, June 27, at 2138 SE Division. Phone 503-517-0808. It was a day to pull out your sun hat and shades, and the Montavilla Farmer's Market was getting revved up for a big season ahead. With many farmers' crops still in their infancy, it's been a bit of a slow start, but more vendors are scheduled to come on board in the next couple of weeks. Read the full Market Watch report or head over there this weekend and see for yourself! 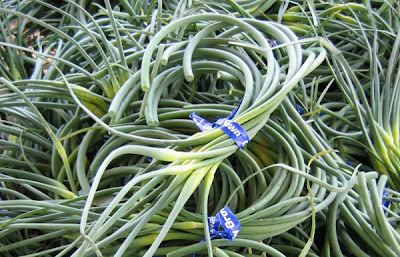 Photo, above: Garlic shoots, also known as scapes or "whistles." Known by a single name, like Dylan or Kreskin or Cher, they're the celebrities of Oregon's spring food scene. Awaited with breathless anticipation, the name "Hoods" is whispered by strawberry fanatics with growing desperation each June. 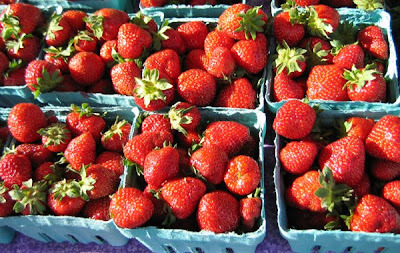 This year it started in mid-May as the farmers' market season opened, and when mid-June rolled around with none in sight, vendors tried staving off angry mobs of string-bag wielding rioters by offering the mobs hot-house strawberries or other varieties like Seascapes and Selvas. Unbelievably sweet, with that deep, strawberry flavor, Hoods are also very delicate and don't keep once they're picked. They need to be eaten or processed the day they're brought home or there's going be a mushy, moldy mess the next day. So get your share of this fleeting pleasure at your local farmers' market while they last or you'll be waiting till next spring's crop flashes its face in public again. My friend Michel met friends on the patio at Lovely Hula Hands the other night, and I asked her to share their experience with GSNW. If the official arrival of summer and warm evenings has you yearning for al fresco dining, get thee to Lovely Hula Hands on North Mississippi. 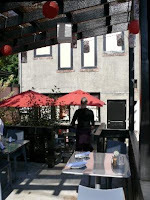 It covers all the bases for a perfect summer supper: charming patio, sassy cocktails, seasonal menu and friendly service. The patio, which is anchored by a rosy salmon-colored wall, is an inviting two-level oasis decorated with festive paper lanterns, sun umbrellas and pretty plantings. On the lower level, a softly bubbling fountain puts you in the mood to go with the cocktail flow. The signature drink, the Lovely Hula Hoop, is a refreshing blend of pineapple-infused Absolut vodka with lemon juice served up with a sugared rim. My personal favorite, the Mojito, is among the city’s best: a perfect balance of Bacardi silver, lime juice, muddled mint and just the right touch of sugar. Local farm deliveries and the chef’s inspiration drive the menu, which changes regularly. But based on a recent visit, odds are it’s all good, all the time. Salads are real standouts. On a recent visit, plates of arugula with prosciutto and shaved parmesan went head-to-head with baby greens, hunks of creamy avocado and toasted almonds. Because we couldn’t decide which was more delicious, we shared both. Our plan to share tastes of four different entrees went astray when three of us just had to have the duck ravioli in brodo with fresh peas and baby spinach. We were fully satisfied with the plump, perfectly cooked pasta squares in clear, rich duck broth until we tasted the other entrée on the table: grilled polenta with a creamy mushroom ragout and grilled asparagus. However, once our polenta envy passed, we happily returned to the ravioli and slurped up every drop of the lovely broth, accompanied with a tasty, affordable Cotes du Rhone. Content from our leisurely meal of cocktails, starters, entrees and wine, we passed on dessert and took home the bottle of Louis Roederer bubbly we’d brought with us. Our server, who always seemed to appear at just the right time, had kept it chilled for us with nary a dirty look. Just as quickly as she’d whisked it away upon our arrival, she returned it to our table with the check and a smile. We’ll be back soon, and the bubbly may come along again, too. My mom has been a big fan and a regular reader of GSNW since it began more than two years ago. As soon as she heard I was writing online, she insisted that we set up her computer so she could just click in her browser bar and access both my and my brother's blogs. While some of my "funny" comments about growing up eating tuna casserole and Spanish rice weren't always well-received, she consistently encouraged me to pursue my passions. And when I started getting regular writing gigs, there was always a call of congratulations when a column or an article appeared, and she had a file folder full of my stories that she culled from her paper. So it was a huge shock when Wednesday morning we got a call that she had passed away suddenly during the night, and our world has been rocked ever since. We're working our way through the things you have to do when a family member passes away, like obituaries, canceling subscriptions and endless paperwork. I still can't make my brain realize that this vivacious, ferocious, funny and intelligent person is gone. That I can't just pick up the phone and tell her how weird it feels because the line has somehow been cut. With time I know the sadness may ebb and the memories will grow stronger. But I'll still miss my biggest fan. 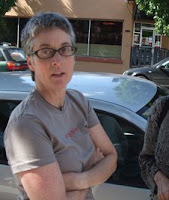 Photo by Steve Bloch, May '08. One of the reasons I switched to writing from advertising was the opportunity to address issues I feel passionate about. My Market Watch column in the Oregonian's FoodDay section is all about the conversation that happens at your local farmers' market when you ask about the garlic or the lettuce or whatever it is they're selling. It's a fundamentally different transaction than shopping at the supermarket and I happen to believe it changes our lives for the better on many different levels. Today's article on the cover of FoodDay, titled "Beervana's Organic Revolution," is about two guys who brew beer, Craig Nicholls of Roots Organic Brewing and Christian Ettinger of Hopworks Urban Brewery (HUB). Not terribly unusual in the Northwest, to be sure, but the fact that every beer they brew is made with organic ingredients is extremely unique. Sure, they want to make the best beer they can, but their real agenda is to change the way things are done, from our system of agriculture to the assumptions underlying the way we live our lives. I think it's worth a read. Maybe over a beer. 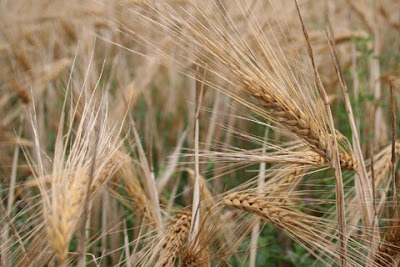 Photo of organic barley from Peak Organic Brewing Company. What better location for a farmers' market than right across the street from a major health facility? Seems like the best kind of synergy, where healthy food and healthy people, as well as health professionals, can all come together and make a difference in each others' lives. Lofty? Corny? I beg to differ. Take a look at today's Market Watch column and decide for yourself! Details: Interstate Farmers' Market. Wed., 3-7 pm. 3550 N Interstate Ave. next to Overlook Park on the MAX Yellow Line. We've all heard about desertification, how climate change is going to turn many places into uninhabitable and unusable land. Geoff Lawton and his colleagues at the Permaculture Research Institute have completed an experiment that changes that assumption, and it's worth watching. When I was growing up, spicy food had nothing to do with Scoville units and no one asked if you'd like mild, medium or blow-your-head-off in a Thai restaurant. The spiciest cuisine available at the time was Italian (yes, Italian) because it used all sorts of strange herbs and, heaven forfend, garlic. Garlic was considered a huge no-no in polite company, and one was advised to partake in a Listerine cleansing should one have the merest contact with the stinking rose. So it was a revelation when I had my first basil pesto at Papa Haydn's on SE Milwaukie that had so much garlic in it that I could taste it for two solid days. And I loved it. Now I can barely imagine cooking without it, and I love the smell of it on my hands after I've chopped fresh cloves. 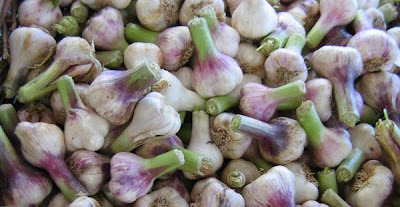 And when I saw the young heads of garlic at Groundwork Organics at the market, I had to have some. I can hardly wait to make a triple garlic sauce in brown butter with fried sage featuring the fresh heads peeled and sliced, curly garlic shoots and roasted cloves of mature garlic. With perhaps just a few red pepper flakes thrown in for some spice. As mentioned below, to me spring is all about babies. And no, I'm not talking about human babies or those little white fuzzy lambs you always see in ads, since spring lamb can actually be up to a year old and nearly full grown. But I digress. So let me start over. Spring is all about sweet young things, especially in the vegetable department. Baby greens, baby carrots, baby heads of romaine, baby bok choy. Tender, sweet and oh-so-fleeting. So when I saw a bag of 20 baby artichokes for five bucks at the Lake Oswego farmers' market, I grabbed them. Using a recipe from Mark Bittman's Minimalist column in the NYT dining section a couple of weeks ago, I made a pasta dish that, if I do say so myself, had a couple more cojones than Bittman's and was oh-so-seasonal. If you can get fresh baby artichokes, more's the better, but if you must resort to frozen, it's still going to kill at your next dinner party. Boil salted water for pasta (a chef friend said it should be as salty as sea water). Combine oil and garlic in a large skillet over low heat. 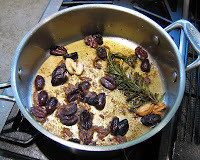 When garlic sizzles, add herb, olives, salt and anchovies. Meanwhile, one at a time, prepare artichokes: remove hard leaves, then cut off spiky end; trim bottoms, cut artichokes in half and add them to pan as they are ready, cut side down. Raise heat so they brown a bit; move them around as you add remaining artichokes so that they brown evenly. 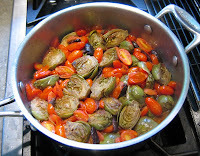 When artichokes brown, add tomatoes and a splash of water. Cook until chokes are tender, 10 to 20 minutes. Add water if needed. Adjust seasoning, then pour over hot pasta and garnish with cheese, with the remainder in a bowl for sprinkling. As artichokes are cooking, cook pasta. When it is done, drain and put in serving bowl. Pour artichoke mixture over top and sprinkle with parmesan. I love to have friends come in from out of town. Especially when they live a fair distance away and I don't get to see them often. But picking a place for dinner can be fraught with uncertainty if there are dietary or budgetary restrictions, or if one person is an adventurous eater and the other isn't. We recently had a couple of friends come to visit and wanted to take them to one of Portland's off-the-beaten track (i.e. not downtown or in the Pearl) places. Half the couple didn't like spicy or unusual food, so that nixed Mexican, Ethiopian or anything too ethnic. And we wanted to be able to chat comfortably, so it needed to be relatively quiet, as well. The food, of course, had to be great, and fortunately there is an abundance of spots that would fit the bill on the east side of town, so the task wasn't too daunting. I'd just been working on an article for FoodDay about cooking large hunks of meat on the grill with the chef from Lauro, Jennifer Beuhler, and she'd mentioned some fabulous dishes she'd just put on the menu that would fit our friends' proclivities. And sure enough, when we got there and ordered drinks and appies, they were both able to find something to love on the menu. One ordered a grilled pork loin and the other drooled over the burger, while Dave got their fantastic seafood paella (photo, top) and I had the lick-the-plate-it-was-so-delicious Portuguese pork and clams. Everyone was happy and satisfied and the catching up on kids, work and plans for the future was accomplished. I'd call that a very successful evening. An added note: Lauro is now open for lunch with a seasonal menu featuring salads, sandwiches, pizzas, pastas, a daily risotto special, a fish entrée and the much-loved Lauro burger. Look for a full report in the near future. Details: Lauro Mediterranean Kitchen, 3377 SE Division, #106. Phone 503-239-7000. I am so lucky to have friends who, as someone in this household is fond of saying, have such "mad skillez." Laurie just went to the beach and wrote up a report for GSNW. Countless others have shared recipes that have become staples on our table. 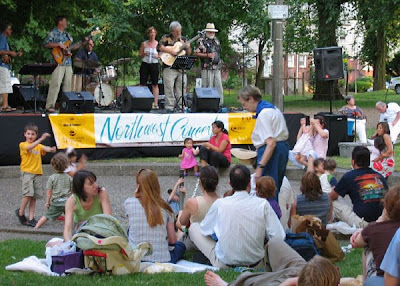 And my friend Michel compiles a yearly list of the outdoor concerts that are scheduled on almost every summer evening all over the city. Here's a sample of the concerts happening through July, and all are listed on the calendar at left. Or you can download the whole list here. Thursdays, 6:30-9:30 pm; $10 per car. 17100 NW Sauvie Island Rd. Phone 503-621-3489. Mondays, 6:30 pm; free. SE Spokane at Willamette River. Tuesdays, 6:30 pm; free. SE 69th & Taylor. Wednesdays, 6:30 pm; free. N Stanton & Vancouver Ave.
Wednesdays, 6:30 pm; SW Macadam & Nebraska at the south end picnic area. It was almost embarrassing. Like when I admitted that, as a native Oregonian, I hadn't ever been to the Steens Mountains in the southeastern corner of Oregon. So one year we decided to remedy the situation and rented a trailer at the Malheur Wildlife Refuge for a week. I had no idea there was a huge wetland right in the middle of the high desert, much less a bird sanctuary teeming with birds stopping on their way across the continent. The Steens themselves were gorgeous with amazing views and mountain goats traipsing over rocky outcroppings. And the French Glen Hotel served a mighty fine and welcome dinner after a day spent gallivanting around the countryside. Glad to have finally paid my respects, I slapped myself for not getting there earlier. 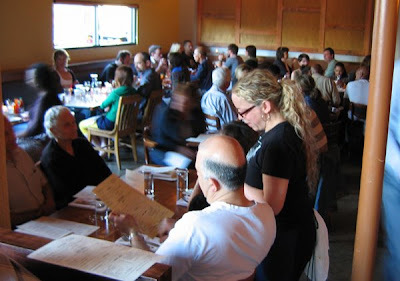 The same feeling washed over me when we finally got around to having dinner at the Screen Door on East Burnside. It was Dave's birthday and, after the requisite happy hour oysters (now $12.95/doz.) at Dan & Louis Oyster Bar, we drove over to the eastside and snagged the last four-top in the room. After ordering fried oysters (you can never have too many oysters), hush puppies and drinks, we browsed the very reasonably priced menu of Southern classics. I went with the fried chicken, which consisted of three very large pieces of (as advertised) crisply fried and perfectly done chicken pieces on a bed of mashers with a small ramekin of tasso gravy and a side of braised greens and bacon. Dave went with the (duh) smoked and barbecued brisket with crispy fried onions and, happily substituted by the waitress, a side of the braised greens. The beef was both a smoky and deeply delicious example of the craft as well as being fall-apart tender. Mr. B chose the Carolina pulled pork sandwich in honor of our recently-departed-for-the-Carolinas friend Richard, though this example, while moist and deliciously smoky, was of the southern (sauce cooked with) rather than northern (sauce added after) variety. 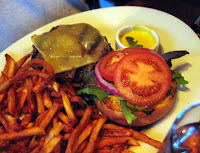 The white bread bun was a classic of the genre and the crunchy fries were excellent. The tab was a nice surprise, too, and considering the amount of food we took home in boxes, well worth the trip. Which made us even more ashamed we hadn't been to this place before. Details: Screen Door Restaurant, 2337 E Burnside. Phone 503-542-0880. 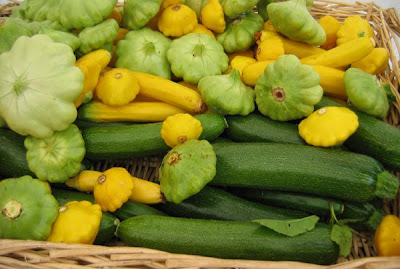 Early summer is the time to find sweet young things like tiny baby zucchini and yellow squashes, terrific salad mixes of young greens and bunches of finger-length baby carrots. 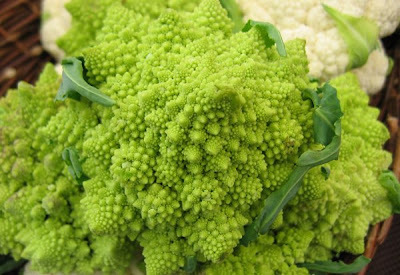 But when I saw these miniature heads of romanesco, I was smitten. A member of the Brassica oleracea family and related to kale, broccoli and cauliflower, it has a stunning chartreuse color that doesn't change when it's cooked, and is a stunner on a platter of raw vegetables. Plus it gives you the opportunity to sound smart when you mention that it's a natural example of fractal geometry as you dunk it into a bowl of sundried tomato dip. 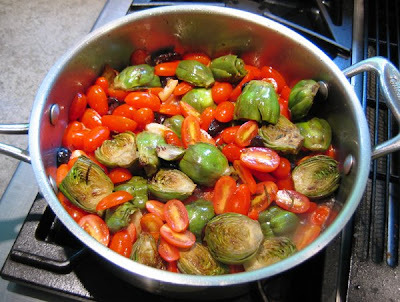 Put the sundried tomatoes in a heat-proof bowl and pour the boiling water over it to reconstitute the tomatoes. When it cools, drain off the water and put the tomatoes in a food processor with the garlic, pine nuts and salt. With the processor running, drizzle in only enough olive oil to make a smooth paste. Add the cream cheese and process till completely incorporated. Adjust seasonings and serve. If Walt Disney built a set for a farmers' market, it would be on a lovely plaza surrounded by grass where young children could play, adding an undertone of happy voices to the soundtrack. It would sit alongside a lake where ducks and canoes could glide by in the background of every shot. Sunshine would filter through the trees, spilling onto the quaint tables where happy customers sit with their coffee and fresh pastries, greeting each other with fond embraces. 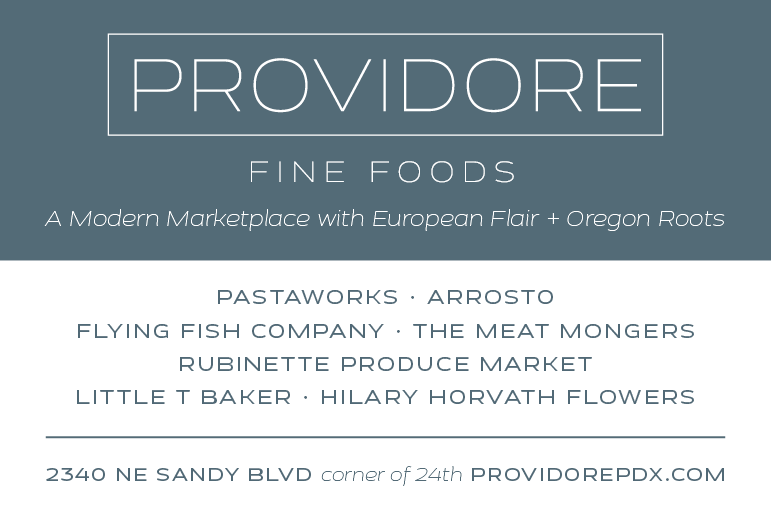 As idyllic as this sounds, it's exactly what you'll find at the Lake Oswego Farmers' Market. Phyllis Seegar (above) makes it all the more appealing as she hands out samples of her daughter's Upper Crust Bread Company bread. Check out this week's Market Watch column for more on this great market. 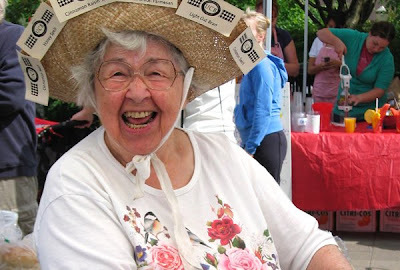 Details: Lake Oswego Farmers' Market. Sat., 8:30 am-1:00 pm; Millennium Plaza Park at 1st and Evergreen streets in downtown Lake Oswego, across the street from Wizer's and adjacent to Lake View Village. Being a homebody, a weekend away from the family is a rare thing in my world. So when Walker needed to travel up to Puyallup to strut his stuff at a dog show last weekend, I headed up north to see what it was all about. The plan was to stay with Corgi breeders Kim and Mark of Samhain Cardigans on their one-acre spread in Auburn, along with Léo, artist, blogger and breeder at Morio Cardigans, and Kim of Coedwig Cardigans. All in all there were 10 dogs outnumbering the six adults, so they had a glorious time running themselves ragged in the yard when we weren't trooping them back and forth from the show. Walker didn't run away with the Best in Show ribbon in his teeth, but he had a great time playing with Casper, Mirage, Lilac and Kayla. 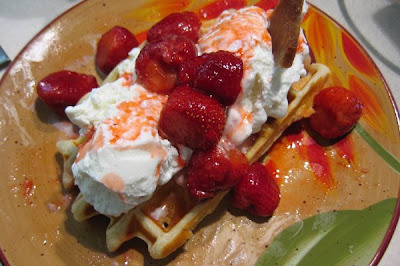 Plus Léo was kind enough to share the recipe for her amazing waffles that we all (including the dogs) agreed were quite fantastic topped with Breyer's vanilla ice cream and whole fresh strawberries. Preheat oven to 300 degrees. Get waffle iron hot. In bowl whisk the dry ingredients. In large mixing bowl whisk the wet ingredients except the whites, 1 Tbsp. sugar and vanilla. Stir them all together. Beat egg whites until stiff, add vanilla and 1 Tbsp. sugar and beat to stiffen again. Fold into rest of batter. The waffle iron should heat all over, not just the center, for the best crisp waffle. As waffles are done, place them in the oven directly on the rack to keep warm and crisp. Do not stack or waffles will lose crispness from the steam they produce. Top with Dickinson's Pumpkin Butter for extra special yumminess. It's time for fresh artichokes, so look for piles of them to start appearing at a farmers' market (or greengrocer's) near you. From teensy babies perfect for sautéing, grilling or baking in a tomato sauce to honkin' globes that can be boiled, trimmed and the leaves dunked into a fresh garlic aioli, these are truly a seasonal delight. 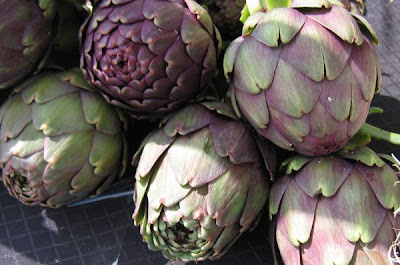 Photo, above: Italian artichokes with their purplish blush. When it's the middle of the week and the vegetable drawer has been emptied of my finds from the weekend market, I head to one of the many mid-week farmers' markets to restock. This week's Market Watch takes a tour of the goods at the Moreland Farmers' Market and comes up with several resources that will fill up your bin. Details: Moreland Farmers' Market. Wed., 3:30-7:30 pm at SE Bybee Blvd. 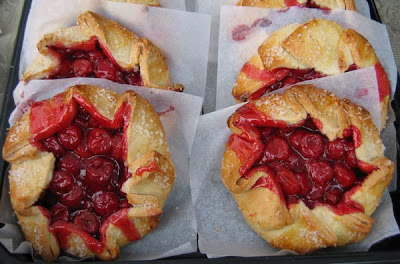 and 14th Ave. Free parking across the street at SE Glenwood and 14th Ave.
Photo, above: Cherry Galettes from Erica Bentson and Krystal O'Neal's Finales Fine Cakes and Desserts.